Activision recently released a new trailer for their upcoming title, Teenage Mutant Ninja Turtles: Out of the Shadows! In designing the upcoming game, Activision and Red Fly Studio wanted to offer players a new vision for a familiar franchise, with a gritty, neon-saturated New York playing a central role in establishing a darker tone for their story. 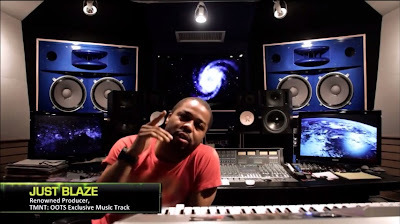 To find the sound that would help define that vibrant, pulsating world, they turned to hip-hop producer and collaborator, Just Blaze. In this behind-the-booth interview, Blaze gives us an inside look at creating the soundtrack to the game's character series trailers, the challenges of putting a new spin on a classic, and how he draws inspiration from working on a franchise he's loved since childhood. See the Just Blaze behind the scenes trailer below!